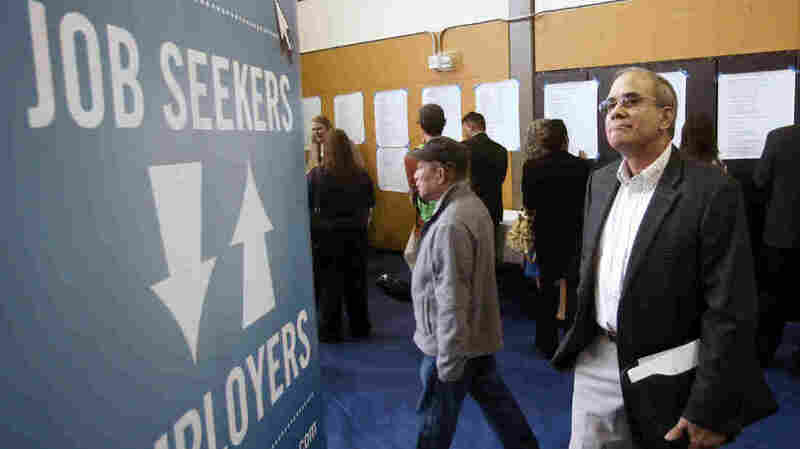 Economists: Romney's 12 Million Jobs Target Realistic, Even If He Loses : It's All Politics Mitt Romney's pledge to add 12 million jobs to the economy over four years may sound like a very big number, especially coming out of a deep recession followed by three years of lackluster job growth. But some economists say it's realistic, and even if President Obama wins re-election. Alan Shull attends a job fair in Portland, Ore., on April 24. Romney claims his leadership would greatly improve the nation's economy: "If we do those five things, our economy will come roaring back," Romney pledged at a rally in Iowa on Friday. "We will create 12 million new jobs in just four years." It sounds like a very big number — 12 million jobs — especially coming out of a deep recession followed by three years of what many have described as lackluster job growth. But it's not as ambitious as it sounds. What makes him so confident? A lot of modeling and a deep dive into industry-level economic data. In particular, he expects the housing market to finally break out of the deep freeze it's been in since the financial crisis hit. "The housing cycle's going to kick into gear. A lot more homes are going to be built, office buildings, retail space. House prices are going to rise," says Zandi. "That's going to lift consumer spending and retailing and leisure and hospitality, and this is going to create a lot of jobs." Zandi isn't the only one predicting robust job growth. Joel Prakken, senior managing director of Macroeconomic Advisers, forecasts 11 million jobs added over the next president's term. "That is not based on anyone's particular set of economic policies," Prakken adds. When he first heard Romney's 12 million jobs claim, Prakken says he scurried to his calculator. And what he found was Romney's campaign promise fit well with broad economic trends. "It's not a projection that's incredible. It's just that it might happen anyway," Prakken says. Romney economic adviser John Taylor takes this and other similar forecasts as validation that the candidate has set a realistic goal. "It's a solid estimate. It's a robust estimate. It's something that can be done with the right policies," Taylor says. Taylor, a professor at Stanford, and three other prominent conservative economists wrote a white paper making the case for Romney's economic plan. The argument in short — this economic recovery has been weaker than those in the past because of Obama's policies. For his part, Obama isn't setting many specific economic goals for his second term, though he has said he'd create a million manufacturing jobs. Taylor says a Romney presidency — with his plan for economic growth — would lead to a more typical recovery. "If we have that kind of recovery again, the prediction is you'd get about 12 million jobs. So that's one way to think about this," Taylor says. Of course, if the economic forecasters are right, we're poised for that more typical recovery over the next four years. No matter whose five-point plan is in place.